My husband has been away for a whole week and both the kids are at college. So it’s been just me and my three dogs at home. No, I am not lamenting about the solitary life I have been leading – it is actually quite nice not to have to do loads and loads of laundry and not to have to pick up after anyone and having full control over the remote control. I can even enjoy the quiet in the house but what I do find tiresome is cooking for just one person (although I am sure the dogs would only be too happy to partake in whatever I cook!). So over the past few days I have taken to making simple salads that taste fresh, are appetizing to look at, with bright colors and which can used be a one dish meal. Tomorrow the household is going to start buzzing again, with the husband flying back home, my daughter driving back from college with a couple of her friends and then my son will arrive early next week. I have already been handed a list of the dishes they kids have been craving and which I have to make over the Thanksgiving break. I am guessing I will be slaving over the stove for the next 10 days at the very least! 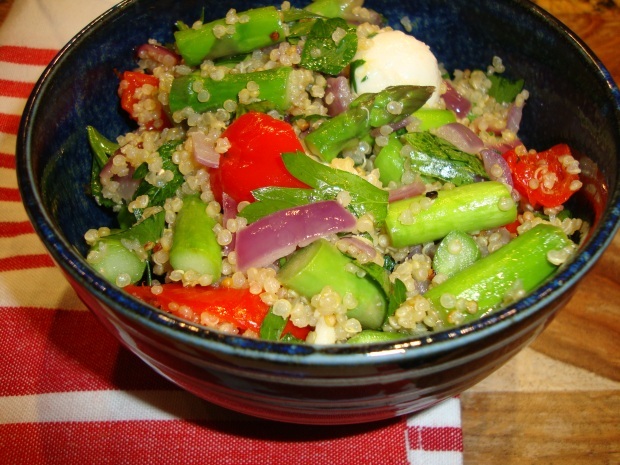 So, tonight as my last hurray I made a Quinoa salad with sweet pickled Peppadews Peppers and Asparagus. 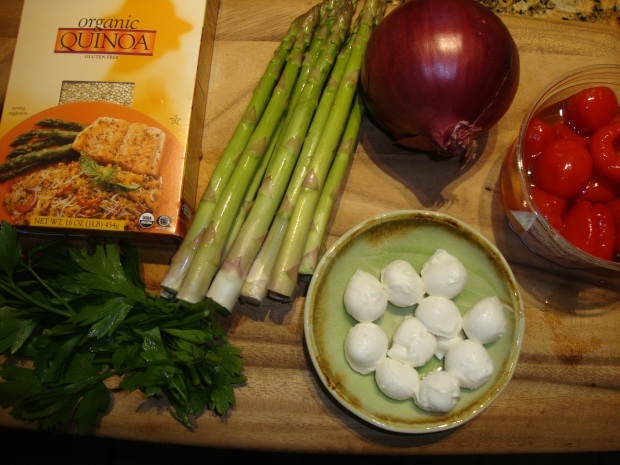 I added a few balls of fresh mozzarella to give it more texture and contrasting color. The dish tasted as good as it looked – pity, I had no one else around to appreciate it! 1. In a medium sauce pan, bring 1/3 cup chicken/vegetable stock and 1/3 cup water to boil. 2. 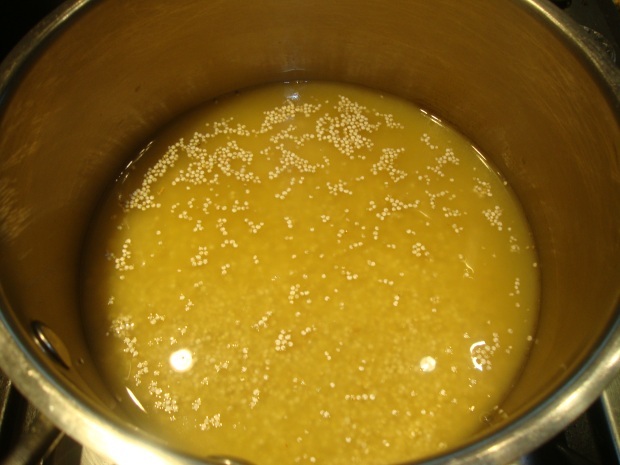 Add the dry quinoa to it and let it simmer over low heat to let the quinoa cook – usually quinoa cooks in 8-10 minutes but keep an eye on it to make sure that it doesn’t burn or stick to the bottom of the pan. If it starts to look dry, add a little bit more water at a time. 3. While the quinoa is cooking, peel and dice the onion. 4. Chop the hard ends of the Asparagus spears and then chop the spears into bite sized pieces. 5. 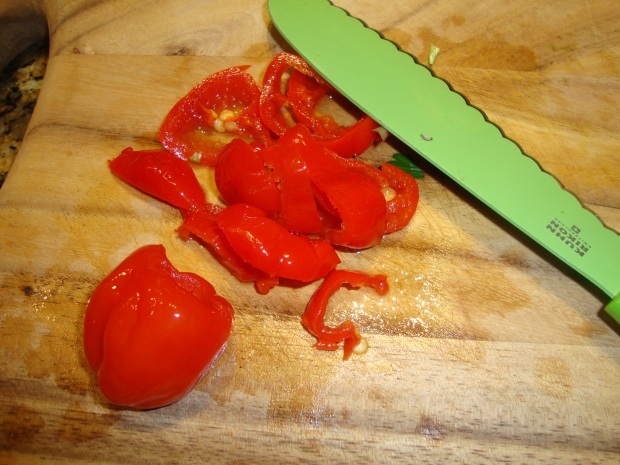 Squeeze the pickling juice out of the Peppadews and then slice them into smaller pieces. 6. 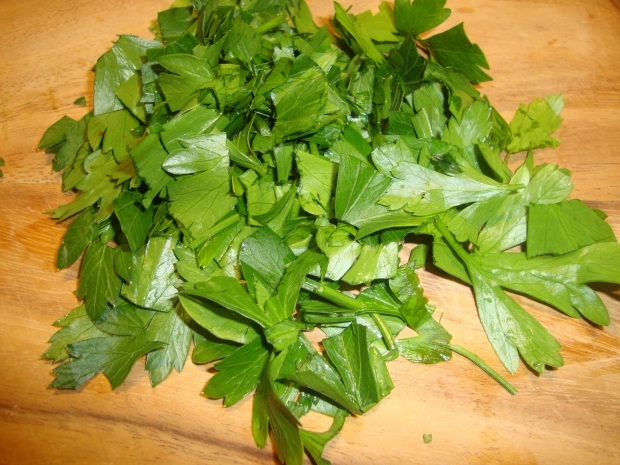 Wash and chop the flat-leafed parsley. 7. 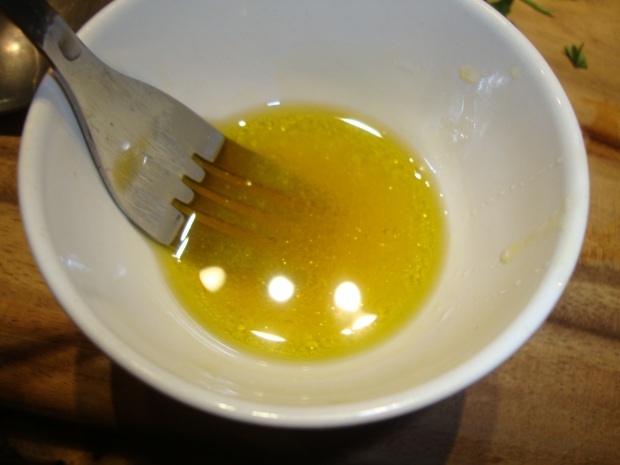 In a small skillet, add one tablespoon of extra virgin olive oil and heat it on medium heat. 8. 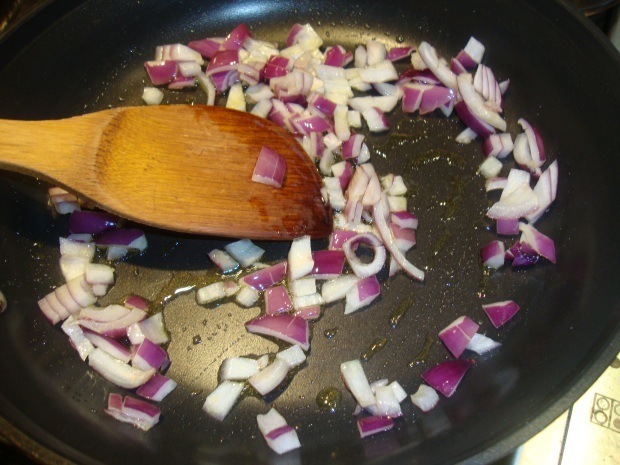 When the oil is hot, add the chopped onion pieces and cook them for 3-4 minutes. 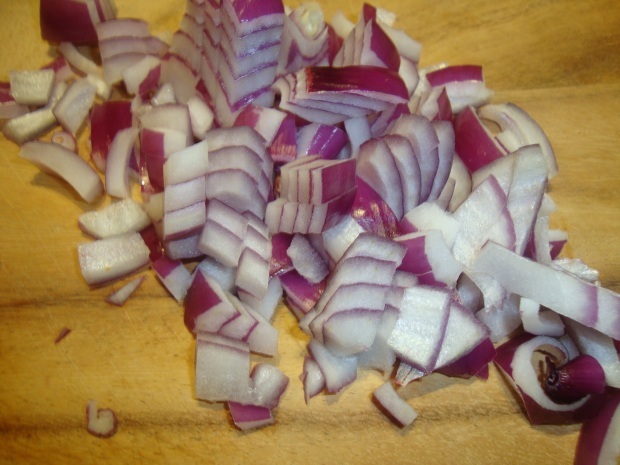 Stir at regular intervals to cook the onions on all sides evenly. 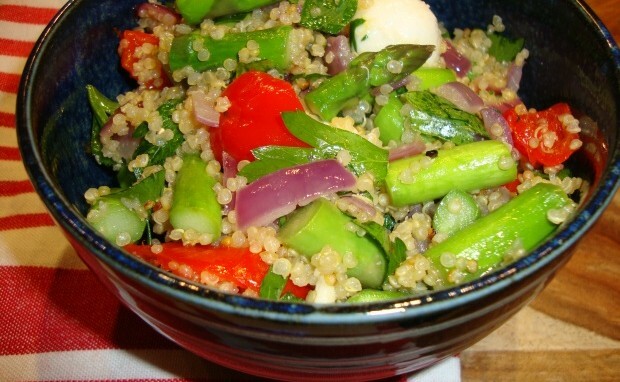 Keep an eye on the Quinoa and when it looks cooked, set it aside to let it cool. 9. 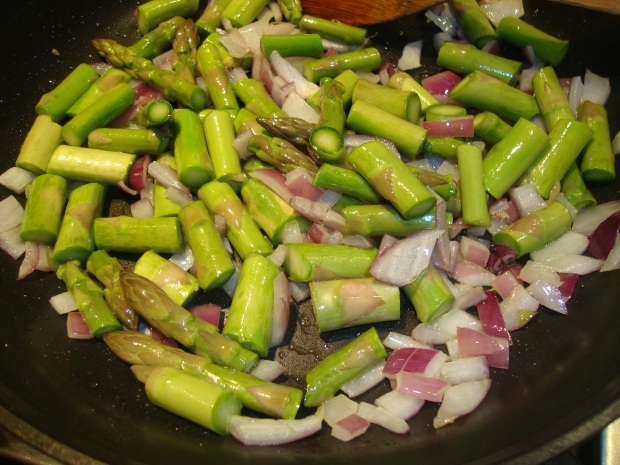 Add the chopped Asparagus pieces to the skillet and cook them for another 3-4 minutes or until they are slightly softened (I like them crunchy). 10. 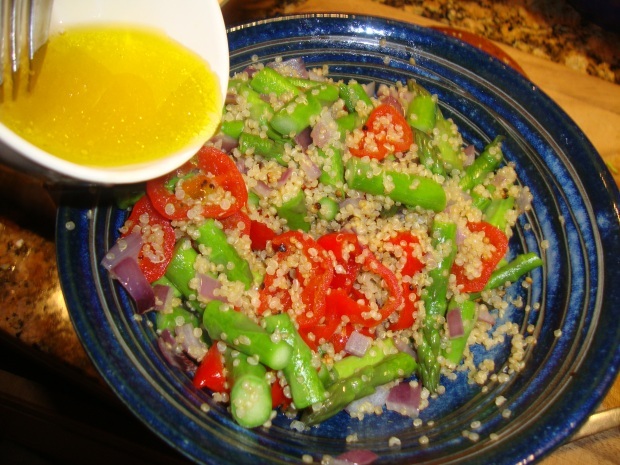 When the quinoa is cooled, made a dressing of 1 tablespoon of pickling juice from the Peppadews, the juice of half a lemon, one tablespoon olive oil, honey and salt. Whisk all these ingredients together. 11. 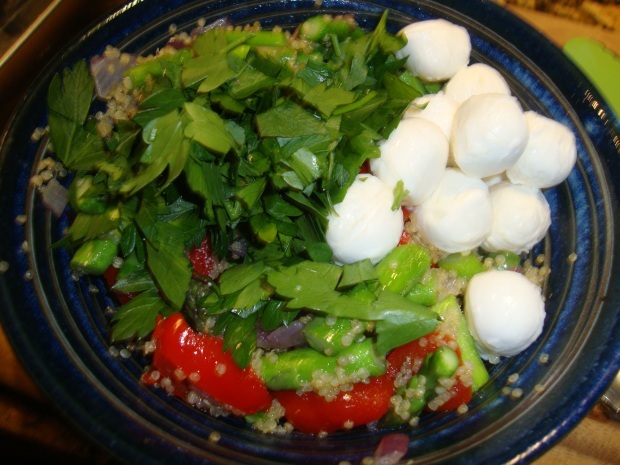 Add the cooked onions, Asparagus, mozzarella and chopped parsley to the bowl containing the quinoa. 12. Pour the dressing over it and gently toss the salad. 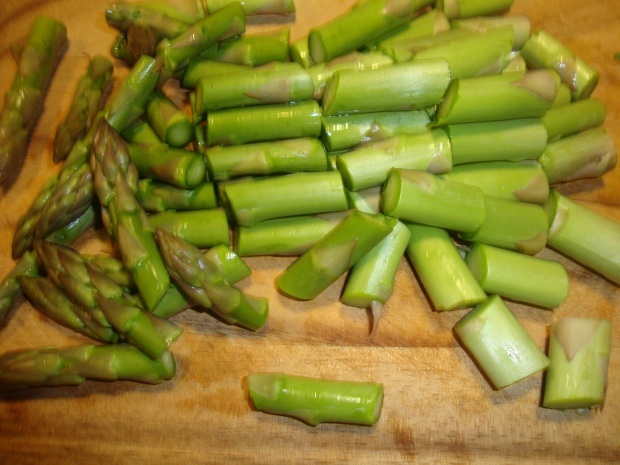 Serve at room temperature or cold – as a side dish or a light meal by itself. I have not heard of these peppers, but when I read the recipe I was wishing I could just hop on the metro and join you for dinner to eat this salad!